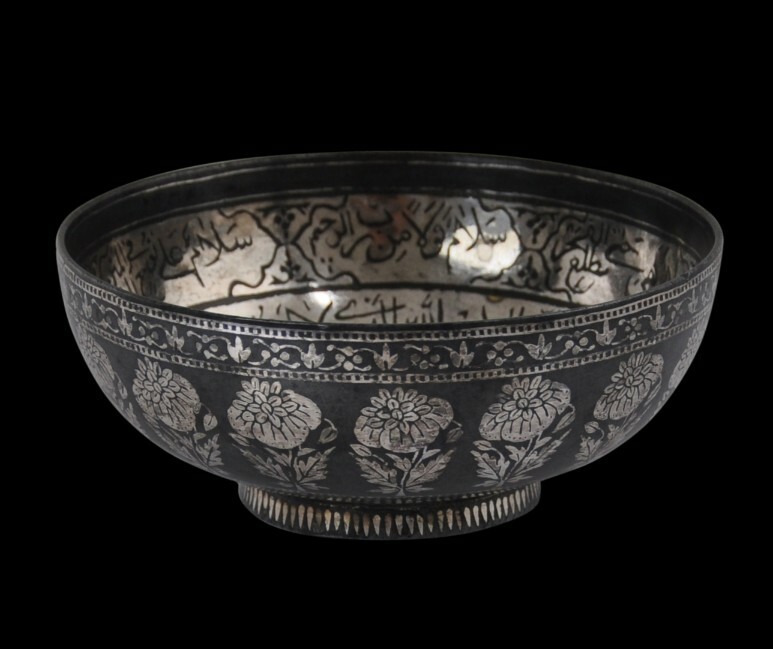 Bidri silver-inlaid magic or medicine bowls are relatively rare. Several examples are in the National Museum, Delhi and illustrated in Lal (1990). 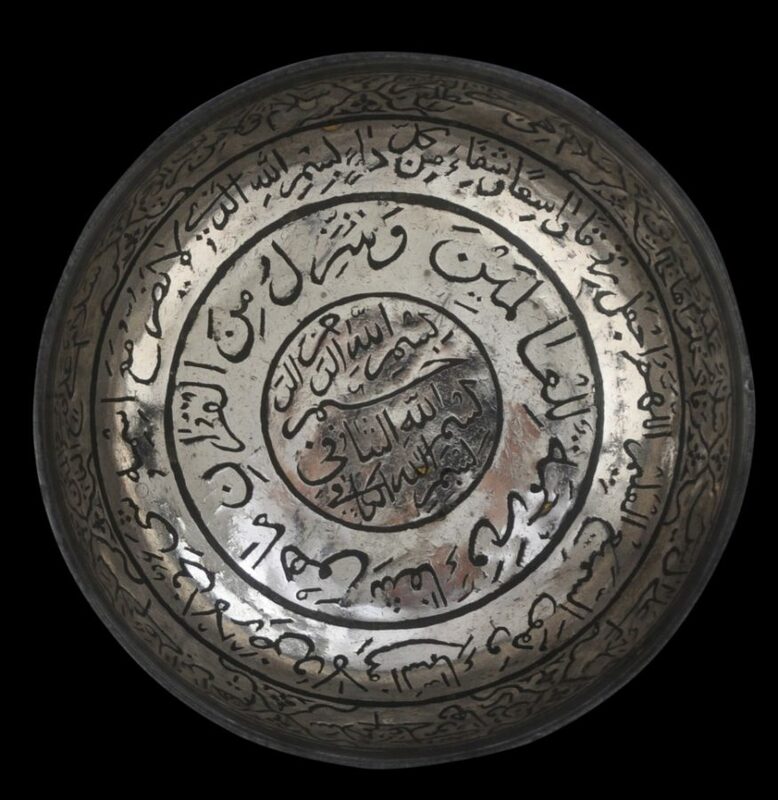 Another example was offered as lot 175 in Sotheby’s ‘Arts of the Islamic World’ sale, April 14, 2010. Those in which the ground is silver rather than dark enamel, such as the example here, are all the more rarer. One was in the Prince Sadruddin Aga Khan Collection, Geneva, and is illustrated in Zebrowski (1997, p. 348). This example has flaring sides and a splayed, ring foot. The inner surface is inscribed all over with verses from the Koran in Arabic Nastaliq script, all done in mahtabi-work whereby the design is marked out by the absence of silver rather than by the silver itself. As such, it is the reverse of the usual way in which Bidri work typically is encountered. 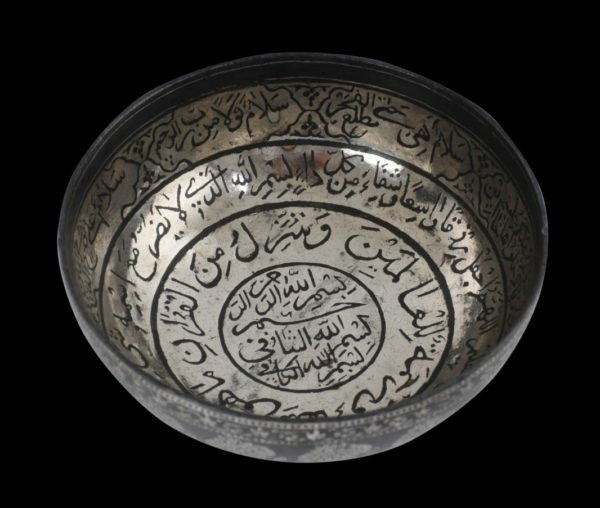 The technique normally involved covering the surface to be decorated with silver sheet that is cut to mark out the script. The outer side is embellished with sixteen stylised flowering poppy plants. The lower and upper borders contain a repeated foliage/floral motif. The outside is decorated in the more usual Bidri manner, known as tehnishan work. A related example attributed to the mid-18th century is illustrated in Mittal (2011, p. 90). 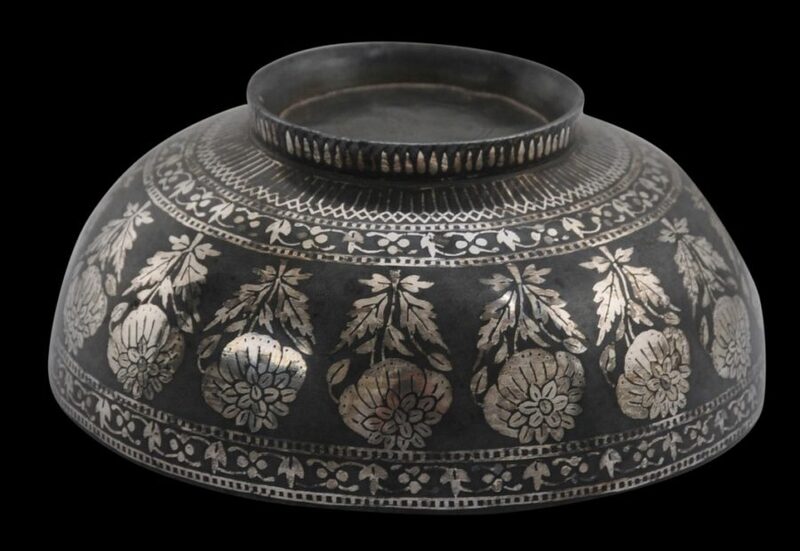 Bidriware originated in the city of Bidar in the Deccan. It is cast from an alloy of mostly zinc with copper, tin and lead. 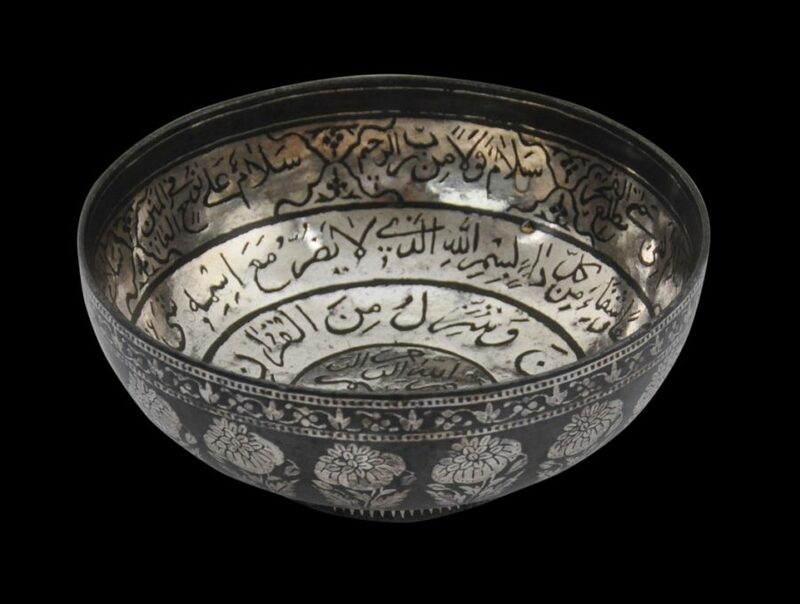 The vessels are overlaid or inlaid with silver (as is the case here), brass and sometimes gold. A paste that contains sal ammoniac is applied which turns the ally dark black but leaving the silver, brass and gold unaffected. 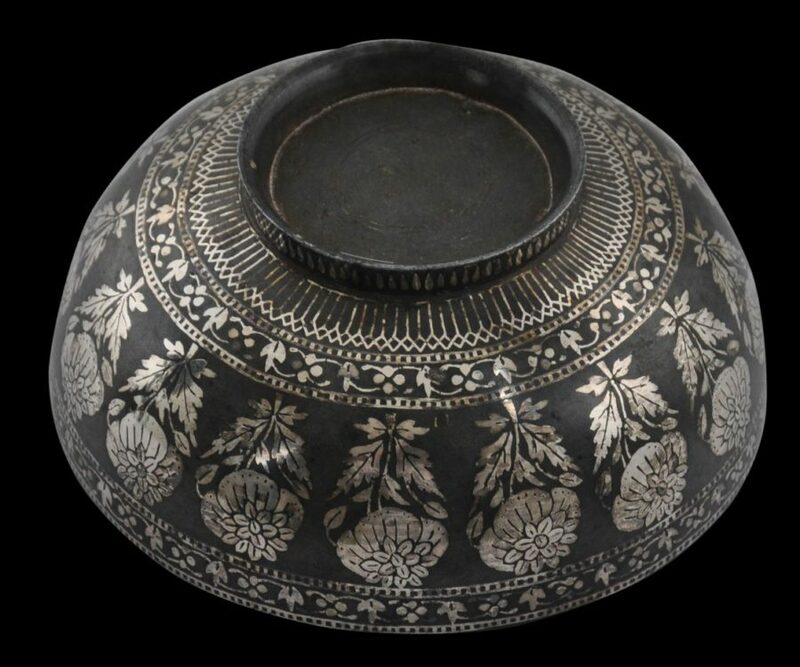 Bidriware caused great interest at the Great Exhibition in London in 1851. It found new European markets and helped to keep alive the craft as demand fell in India with the decline of many of the smaller courts and landed families. The example here is in fine condition with no significant losses to the silver inlay. Lal, K., Bidri Ware: National Museum Collection, National Museum New Delhi, 1990. Mittal, J., Bidri Ware and Damascene Work: in Jagdish & Kamla Mittal Museum of Indian Art, Jagdish & Kamla Mittal Museum of Art, 2011. 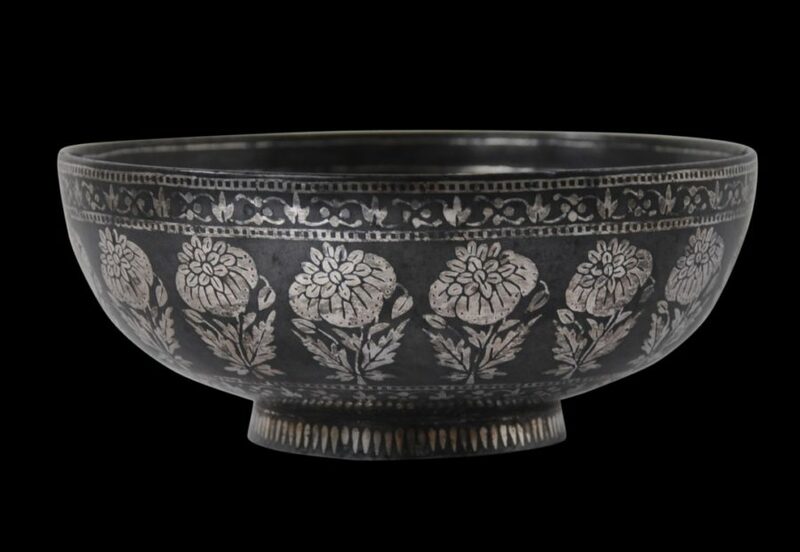 Stronge, S., Bidri Ware: Inlaid Metalwork from India, Victoria & Albert Museum, 1985.